Philadelphia Jack O'Brien was one of the most colorful fighters of the early twentieth century. A showman and a shrewd self-publicist, O'Brien was a great boxer as well. His strong left jab and solid right were complemented by his skill at blocking punches and countering attacks. Debuting as a lightweight, O'Brien turned professional at age eighteen in 1896 in his native Philadelphia. As he matured, O'Brien moved into the welterweight and then middleweight classes. Ultimately he fought light heavyweights and heavyweights, even though he never weighed more than 165 pounds. In 1901 O'Brien sailed for England, where he hoped to build up his record. O'Brien won all nineteen of his fights there, fifteen by knockout. Not all of his opponents were of the first rank, but O'Brien nevertheless sent reports of his victories to the Associated Press, which alerted American fans to his success. Returning to the United States in glory (and reportedly with eighteen trunks of new clothes), O'Brien was greeted at the dock by the mayor of Philadelphia and a crowd of 10,000 fans. O'Brien hit the lecture circuit with Major Anthony J. Drexel Biddle, a prominent Philadelphian and avid boxing fan who encouraged young men to emulate O'Brien's "muscular Christianity." Over the next few years, O'Brien fought such notables as Joe Choynski, Joe Walcott (Barbados), and Young Peter Jackson. By 1905, his string of successes allowed him to challenge Bob Fitzsimmons, the recognized world light heavyweight titleholder. Fitzsimmons, then 44, also claimed the heavyweight title, vacant since the retirement of James J. Jeffries. Fitzsimmons collapsed after thirteen rounds with O'Brien. Now acknowledged as the light heavyweight champ and, in some quarters, as the heavyweight champ, O'Brien embarked on a vaudeville tour to capitalize on his fame. 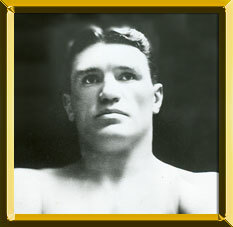 In 1906, O'Brien fought to a draw with the more widely recognized heavyweight titleholder, Tommy Burns, in Los Angeles. In a rematch, Burns won the twenty-round decision. In 1909, Stanley Ketchel made his eastern debut against O'Brien at the National Athletic Club in New York. O'Brien dominated the first six rounds, but in the ninth, Ketchel knocked him down. In the tenth, O'Brien was decked twice and only the bell saved him from a knockout. O'Brien retired in 1912, never having defended his light heavyweight title. After a financial reversal resulting in bankruptcy, O'Brien operated a successful gym in New York.